Over the years I’ve been very fortunate that friends have kept me in mind whenever they find sportswear I might be interested in. Such was the case of the swim bra and matching skirt above which was tentatively offered to me from a VFG friend as a gift because the bikini bottom was missing. I loved it so much that I took it, thinking the bottom would eventually turn up on ebay (which was pretty much the only place to look in those days). 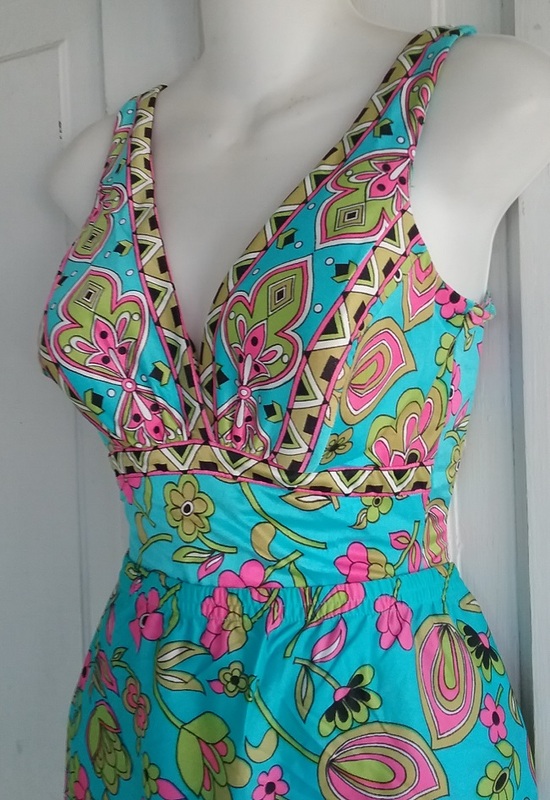 You wouldn’t think there would be much of a market for the bottom half of a two-piece swimsuit, but look through the sales listings and you will see that quite a few are listed at any given time. For years I’ve had this set in mind while doing my regular Catalina search, now not just on eBay, but also on Etsy and Ruby Lane as well. I finally got lucky, but not in the way I’d thought I would. I recently located a matching one-piece suit. And it’s like a 1970s swimsuit version of the mother-daughter matching ensembles of the 1950s and early 60s. I say that because the two suits (and I say this without even seeing the bottom half of the bikini) were made to appeal to two entirely women. 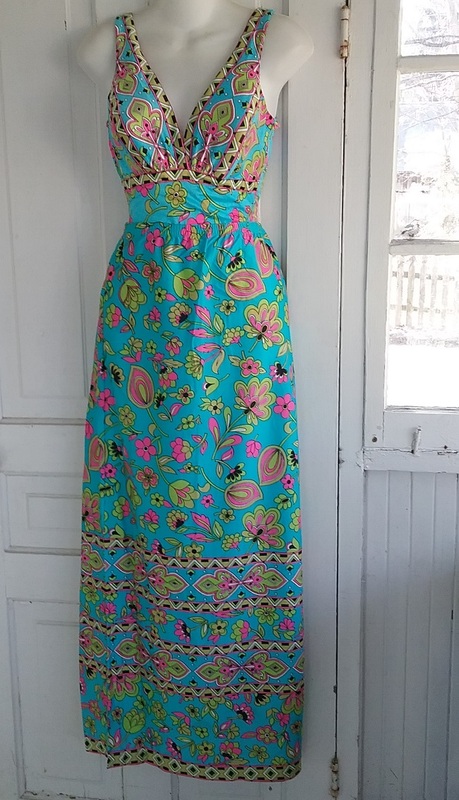 In 1972 or whenever these were made, I would have definitely worn the bikini, and I can see my mother in the much more covered up one-piece, though the print might have been a bit bold for her taste. It was certainly her style. All the moms wore this style, with a modest front and this very deep scooped back. We all know about mom jeans, but I’ll forever think of this style as the mom bathing suit. The one-piece looks great with the skirt. What you can’t see is a side split up to the knee in the skirt, which makes it possible to walk in such a narrow style. 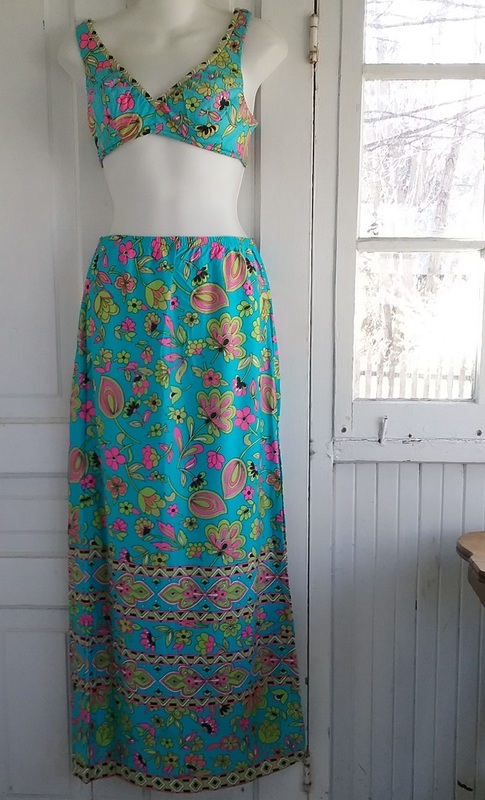 I can imagine this skirt took the original owner straight from the pool to the cocktail lounge. There’s a bit of difference of color in the bathing suit and the skirt. It could be different dye lots that are responsible, but I tend to think that the one-piece just got more use and is a bit faded. It’s made of nylon, and yes, nylon will fade. As would be expected, the same label is in all three pieces. So my search for the bikini pants is not over, but I am really pleased to how have an addition to the set. I’m also still looking for an ad, so let me know if any of you stumbles across this in a 1970s newspaper or magazine. I have always liked Catalina as a brand, but the more vintage Catalina clothing I see, the more I love it. They were really big into matching pieces, in swimwear and in casual sportswear. In fact, I have another great Catalina piece to write about in the near future.